Notice in Edge the opening of the larynx is even more narrowed, and the cuneiforms are rolled in even more than in Overdrive. This makes it hard to see the vocal folds. The narrowing creates an even flatter angle between the arytenoids and the aryepiglottic fold and also an even more acute angle between the aryepiglottic fold and epiglottis. The piriform fossae and area between the back wall (posterior pharyngeal wall) and the larynx becomes very small and is often closed off altogether. 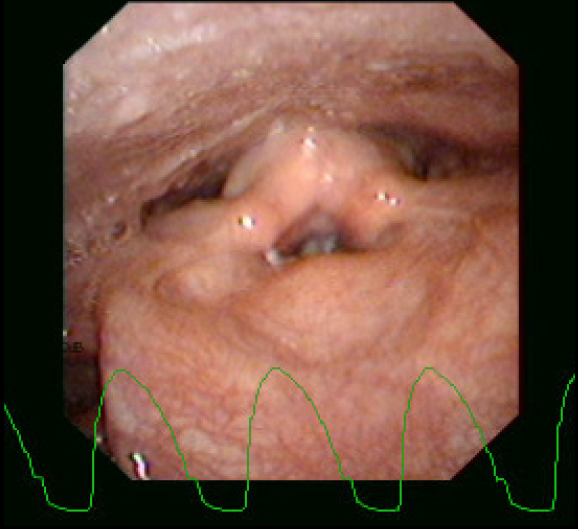 The larynx is raised to a higher position (you can see that it gets closer to the camera). Also notice the Edge laryngograph waveform shows a steep onset and a quite long closure of the vocal folds with a gradual roll off. The steep onset indicates that the vocal folds are coming together very rapidly and stay together for longer, so they are closed much longer than they are open. This corresponds nicely with the loud volume often used in Edge.